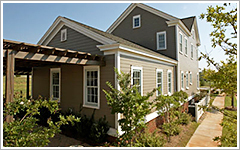 Harden the envelope with James Hardie Fiber-Cement Siding. If you live in a high fire area or are planning to build in the Wildland-Urban Interface (WUI) then you may want to consider Artisan V-Rustic exterior siding. Designed and engineered to perform in exterior applications with the appearance of wood siding without the drawbacks common to wood. Historically accurate for any style home, Artisan V-Rustic premium exterior fiber-cement siding from James Hardie resists the harshest weather, fungal decay, pests and the spread of flame, providing greater security from fire. The innovative Lock Joint system enables a blind nail application, offering homeowners a beautiful seamless aesthetic. Light, fast and easy to load, the Max SuperSider just may be the nailer for you. This well balanced coil nailer has enough power to drive nails home in sheathing, subflooring, roof decking, fencing and siding. The unique slim guide contact arm design, guides a nail perpendicularly all the way to the end, preventing bent nails or driver marks around the nail head.